5S was established in Japan as five pillars of progress to create a lean methodology for inventory management: seiri, seiton, seiso, seiketsu, shitsuke. These Japanese pillars have been identified as one of the techniques that enabled "just in time" manufacturing, and they have been translated into several American versions with various "S" themes. 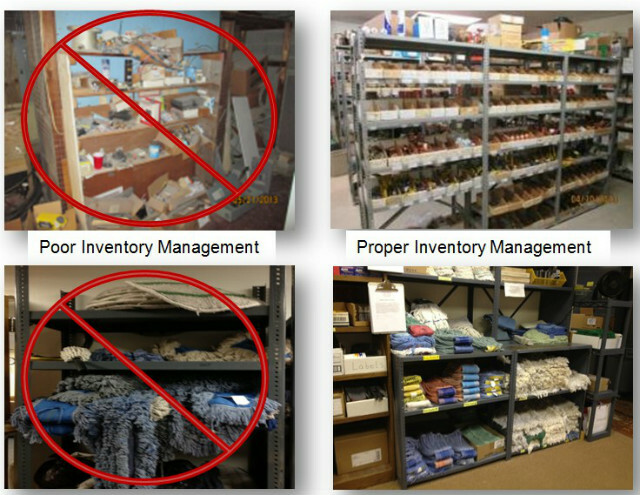 Although the intent originated with manufacturing, the methodology can be applied to all facility management settings where inventory management is a vital element to a successful program. It can also be applied to knowledge-economy work, with information, software or media in the place of physical product. One variation presents as: sort, stabilize, shine, standardize, sustain. This lean practice creates a superior work environment by improving working conditions. The goal is to reduce wasted space and optimize productivity through an organized workplace with consistent results. The 5S lean methodology describes how to organize a work space for efficiency and effectiveness by identifying and storing the items used, maintaining the area and items, and sustaining the new order. This process is effective across all applications of service and should be incorporated in into any FM program. The intent of 5S is to have only what you need available in the workplace, a designated place for everything, a standard way of doing things and the discipline to maintain it. These pillars of progress build upon each and must be implemented in a tiered fashion. This starts by "cleaning house." Eliminate all items from the workplace that are not needed. Keep only essential items and remove what is not required, prioritizing things per requirements and keeping them in easily-accessible places. If your inventory is overwhelming, then breaking the area into quadrants and working in waves may be a good approach. Move through the inventory with a color-coded system where items that are to be discarded are tagged red and those that are to be kept will be green. During the first pass if there are questionable products, those can be tagged as yellow to determine their destiny in subsequent passes. During the second pass, remove all red-tagged items, which will immediately reduce your total inventory. Sorting enables the team to repossess valuable floor space and identify and remove broken tools, scrap and excess material. Label and arrange necessary items so that they are easy to locate and put away. This may require secondary revisions once the workflow is implemented and certain groupings are identified through the process. Ensure that all shelving is free of rust and solid for use. A fresh coat of paint may be necessary to generate a clean environment. Make sure everything is clean, functioning properly and ready for use. A clean workspace generates greater productivity and this includes "storage space." A scheduled cleaning of the area should be implemented to maintain the area. Ensure a uniform process that is adhered to routinely. Routines that maintain organization and orderliness are essential to a smooth and efficient flow of activities. Ensure disciplined adherence to guidelines and processes. Develop good habits of properly maintaining inventory, tools and equipment. This is a structured program that improves safety, work efficiency, productivity and ownership, while supporting a smooth production process in various ways. Searching for tools is eliminated, flow principles are applied, tools are stored where they are needed most, location indicators visualize how things have been organized, and nonconformities are easily identified. The end result of a solid 5S program is fewer delays in service, less waste and enhanced efficiencies. These advantages translate to lower cost and higher quality. Team members will be able to find things easily, every time. The workplace will be cleaner and safer. Tasks will be simpler and more satisfying with less hindrance and greater job satisfaction.